For the area in Nairobi, Kenya, see Kibera. For the village in Peru, see Saweto, Peru. Soweto (/səˈwɛtoʊ, -ˈweɪt-, -ˈwiːt-/) is a township of the City of Johannesburg Metropolitan Municipality in Gauteng, South Africa, bordering the city's mining belt in the south. Its name is an English syllabic abbreviation for South Western Townships. 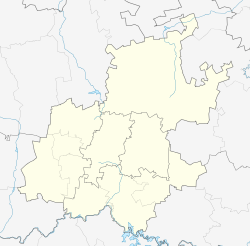 Formerly a separate municipality, it is now incorporated in the City of Johannesburg Metropolitan Municipality, Suburbs of Johannesburg. George Harrison and George Walker are today credited as the men who discovered an outcrop of the Main Reef of gold on the farm Langlaagte in February 1886. The fledgling town of Johannesburg was laid out on a triangular wedge of "uitvalgrond" (area excluded when the farms were surveyed) named Randjeslaagte, situated between the farms Doornfontein to the east, Braamfontein to the west and Turffontein to the south. Within a decade of the discovery of gold in Johannesburg, 100,000 people flocked to this part of the Zuid-Afrikaansche Republic in search of riches. They were of all races and all nationalities. In October 1887 the government of the South African Republic (ZAR) bought the south-eastern portion of the farm Braamfontein. There were large quantities of clay, suitable for brickmaking, along the stream. The government decided that more money was to be made from issuing brick maker's licences at five shillings per month. The result was that many landless Dutch-speaking burghers (citizens) of the ZAR settled on the property and started making bricks. They also erected their shacks there. Soon the area was known either Brickfields or Veldschoendorp. Soon other working poor, Coloureds, Indians and Africans also settled there. The government, who sought to differentiate the white working class from the black, laid out new suburbs for the Burghers (Whites), Coolies (Indians), Malays (Coloureds) and Black Africans (Africans), but the whole area simply stayed multiracial. Soweto was created in the 1930s when the White government started separating Blacks from Whites, creating black "townships". Blacks were moved away from Johannesburg, to an area separated from White suburbs by a so-called cordon sanitaire (or sanitary corridor) this was usually a river, a railway track, an industrial area or a highway etc., they did this by using the infamous 'Urban Areas Act' in 1923. William Carr, chair of non-European affairs, initiated the naming of Soweto in 1959. He called for a competition to give a collective name to townships dotted around the South-west of Johannesburg. People responded to this competition with great enthusiasm. Among the names suggested to the City Council was KwaMpanza, meaning Mpanza's place, invoking the name of Mpanza and his role in bringing the plight of Orlando sub tenants to the attention of the City Council. The City Council settled for the acronym SOWETO (South West Townships). The name Soweto was first used in 1963 and within a short period of time, following the 1976 uprising of students in the township, the name became internationally known. Soweto became the largest Black city in South Africa, but until 1976 its population could have status only as temporary residents, serving as a workforce for Johannesburg. It experienced civil unrest during the Apartheid regime. There were serious riots in 1976, sparked by a ruling that Afrikaans be used in African schools there; the riots were violently suppressed, with 176 striking students killed and more than 1,000 injured. Reforms followed, but riots flared up again in 1985 and continued until the first multiracial elections were held in April 1994. In 2010, South Africa's oldest township hosted the FIFA Soccer World Cup final and the attention of more than a billion soccer spectators from all over the world was focused on Soweto. In April 1904 there was a bubonic plague scare in the shanty town area of Brickfields. The town council decided to condemn the area and burn it down. Beforehand most of the Africans living there were moved far out of town to the farm Klipspruit (later called Pimville), south-west of Johannesburg, where the council had erected iron barracks and a few triangular hutments. The rest of them had to build their own shacks. The fire brigade then set the 1600 shacks and shops in Brickfields alight. Thereafter the area was redeveloped as Newtown. Pimville was next to Kliptown, the oldest Black residential district of Johannesburg and first laid out in 1891 on land which formed part of Klipspruit farm. The future Soweto was to be laid out on Klipspruit and the adjoining farm called Diepkloof. In the Zuid-Afrikaansche Republiek and the subsequent Transvaal Colony it was lawful for people of colour to own fixed property. Consequently, the township of Sophiatown was laid out in 1903 and Blacks were encouraged to buy property there. For the same reasons Alexandra, Gauteng was planned for Black ownership in 1912. The subsequent Natives Land Act of 1913 did not change the situation because it did not apply to land situated within municipal boundaries. In 1923 the Parliament of the Union of South Africa passed the Natives (Urban Areas) Act (Act No. 21 of 1923). The purpose of the Act was to provide for improved conditions of residence for natives in urban areas, to control their ingress into such areas and to restrict their access to intoxicating liquor. The Act required local authorities to provide accommodation for Natives (then the polite term for Africans or Blacks) lawfully employed and resident within the area of their jurisdiction. Pursuant to this Act the Johannesburg town council formed a Municipal Native Affairs Department in 1927. It bought 1 300 morgen of land on the farm Klipspruit No. 8 and the first houses in what was to become Orlando Location were built there in the latter half of 1930. The township was named after the chairman of the Native Affairs committee, Mr. Edwin Orlando Leake. In the end some 10,311 houses were built there by the municipality. In addition it built 4,045 temporary single-room shelters. In about 1934 James Sofasonke Mpanza moved to 957 Pheele Street, Orlando, and lived there for the rest of his life. A year after his arrival in Orlando he formed his own political party, the Sofasonke Party. He also became very active in the affairs of the Advisory Board for Orlando. Towards the end of World War II there was an acute shortage of housing for Blacks in Johannesburg. By the end of 1943 the Sofasonke Party advised its members to put up their own squatters' shacks on municipal property. On Saturday 25 March 1944 the squat began. Hundreds of homeless people from Orlando and elsewhere joined Mpanza in marching to a vacant lot in Orlando West and starting a squatters camp. The City Council's resistance crumbled. After feverish consultations with the relevant government department, it was agreed that an emergency camp, which could house 991 families, be erected. It was to be called Central Western Jabavu. The next wave of land invasions took place in September 1946. Some 30,000 squatters congregated west of Orlando. Early the next year the City Council proclaimed a new emergency camp. It was called Moroka. 10,000 sites were made available immediately. 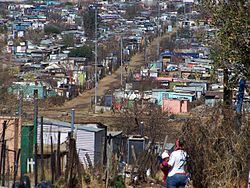 Moroka became Johannesburg's worst slum area. Residents erected their shanties on plots measuring six metres by six metres. There were only communal bucket-system toilets and very few taps. The camps were meant to be used for a maximum of five years, but when they were eventually demolished in 1955, Moroka and Jabavu housed 89,000 people. In 1941 the British Government built a military hospital next to the road between Johannesburg and Potchefstroom. 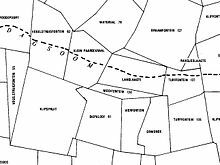 The exact place was to be at the 8th milestone near the old Wayside Inn, owned by a Cornishman called John Albert Baragwanath. It was called The Imperial Military Hospital, Baragwanath. After the war the Transvaal Provincial Administration bought the hospital for £1 million. On 1 April 1948 the Black section of Johannesburg Hospital (known as Non-European Hospital or NEH) was transferred to Baragwanath Hospital. In 1997 the facility was renamed Chris Hani-Baragwanath Hospital after former General Secretary of the South African Communist Party, Chris Hani. The National Party won the general election of 1948 and formed a new government. The party's policy was called apartheid, the Afrikaans word meaning separateness. They thought they could separate the various racial groups in South Africa. In those days the Johannesburg City Council did not support the National Party. The City Council and the central government competed to control the Black townships of Johannesburg. Following the election of the new government, some 7,000 new houses were built in the first two or three years, but very little was done thereafter. In 1952 there was a breakthrough. Firstly the Council for Scientific and Industrial Research came up with a standard design for low-cost, four-roomed, forty-square-metre houses. In 1951 the Parliament passed the Building Workers Act, which permitted Blacks to be trained as artisans in the building trade. In 1952 it passed the Bantu Services levy Act, which imposed a levy on employers of African workers and the levy was used to finance basic services in Black townships. In 1954 the City Council built 5,100 houses in Jabavu and 1,450 in Mofolo. The City Council's pride and joy was its economic scheme known as Dube Village. It was intended "primarily for the thoroughly urbanised and economically advanced Native". Stands, varying in size from fifty by hundred feet to forty by 70 feet, were made available on a thirty-year leasehold tenure. Tenants could erect their own dwellings in conformity with approved plans. In June, 1955, Kliptown was the home of an unprecedented Congress of the People, which adopted the Freedom Charter. According to wiredspace, 44 the name Soweto was officially endorsed by the municipalities’ authorities only in 1963 after a special committee had considered various names. Apartheid governments’ intention was for Soweto to house the accommodate black people that were working for Johannesburg “Incidentally, the name Soweto was officially endorsed by the municipal authorities only in 1963 after a special committee had sat for a long time, considering various names, including apartheid Townships and Verwoerdstad” (Gorodnov, 1998:58). From the onset the Apartheid government purposed Soweto to house the bulk of the labour force which was needed by Johannesburg (1998:58). Africans used to live in areas surrounding the city, so the authorities felt it would be more expedient to concentrate black workers in one district that could be easily controlled (1998:58). 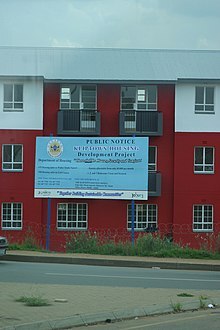 The new sub-economic townships took off in 1956, when Tladi, Zondi, Dhlamini, Chiawelo and Senoane were laid out providing 28,888 people with accommodation. Jabulani, Phiri and Naledi followed the next year. Sir Ernest Oppenheimer arranged a loan of £3 million from the mining industry, which allowed an additional 14,000 houses to be built. It was decided to divide Soweto into various language groups. Naledi, Mapetla, Tladi, Moletsane and Phiri were for Sotho- and Tswana-speaking people. Chiawelo for Tsonga and Venda. Dlamini Senaoane, Zola, Zondi, Jabulani, Emdeni and White City were for Zulus and Xhosas. The central government was busy with its own agenda. The presence of Blacks with freehold title to land among Johannesburg's White suburbs irked them. In 1954 Parliament passed the Native Resettlement Act, which permitted the government to remove Blacks from suburbs like Sophiatown, Martindale, Newclare and Western Native Township. Between 1956 and 1960 they built 23,695 houses in Meadowlands and Diepkloof to accommodate the evicted persons. By 1960 the removals were more-or-less complete. In 1959 the City Council launched a competition to find a collective name for all the townships south-west of the city's centre. It was only in 1963 that the City Council decided to adopt the name Soweto as the collective name. In 1971 Parliament passed the Black Affairs Administration Act, No. 45 of 1971. In terms of this Act the central government appointed the West Rand Administration Board to take over the powers and obligations of the Johannesburg City Council in respect of Soweto. As chairman of the board it appointed Manie Mulder, a political appointment of a person who had no experience of the administration of native affairs. Manie Mulder's most famous quote was given to the Rand Daily Mail in May 1976: "The broad masses of Soweto are perfectly content, perfectly happy. Black-White relationships at present are as healthy as can be. There is no danger whatever of a blow-up in Soweto." Soweto came to the world's attention on 16 June 1976 with the Soweto Uprising, when mass protests erupted over the government's policy to enforce education in Afrikaans rather than their native language. Police opened fire in Orlando West on 10,000 students marching from Naledi High School to Orlando Stadium. 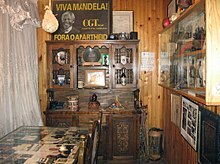 The rioting continued and 23 people died on the first day in Soweto, 21 of whom were black, including the minor Hector Pieterson, as well as two white people, including Dr Melville Edelstein, a lifelong humanitarian. Diepmeadow Town Council, Greater Soweto. In response, the apartheid state started providing electricity to more Soweto homes, yet phased out financial support for building additional housing. Soweto became an independent municipality with elected black councilors in 1983, in line with the Black Local Authorities Act. Previously the townships were governed by the Johannesburg council, but from the 1970s the state took control. A man takes a nap while riding in the bed of a pickup truck in Soweto, South Africa, Freedom Day, 2006. Black African councilors were not provided by the apartheid state with the finances to address housing and infrastructural problems. Township residents opposed the black councilors as puppet collaborators who personally benefited financially from an oppressive regime. Resistance was spurred by the exclusion of blacks from the newly formed tricameral Parliament (which did include Whites, Asians and Coloreds). Municipal elections in black, coloured, and Indian areas were subsequently widely boycotted, returning extremely low voting figures for years. Popular resistance to state structures dates back to the Advisory Boards (1950) that co-opted black residents to advise whites who managed the townships. In Soweto, popular resistance to apartheid emerged in various forms during the 1980s. Educational and economic boycotts were initiated, and student bodies were organized. Street committees were formed, and civic organizations were established as alternatives to state-imposed structures. One of the most well-known "civics" was Soweto's Committee of Ten, started in 1978 in the offices of The Bantu World newspaper. Such actions were strengthened by the call issued by African National Congress's 1985 Kabwe congress in Zambia to make South Africa ungovernable. As the state forbade public gatherings, church buildings like Regina Mundi were sometimes used for political gatherings. 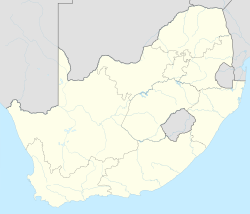 In 1995, Soweto became part of the Southern Metropolitan Transitional Local Council, and in 2002 was incorporated into the City of Johannesburg. A series of bomb explosions rocked Soweto in October 2002. The explosions, believed to be the work of the Boeremag, a right-wing extremist group, damaged buildings and railway lines, and killed one person. As Soweto was counted as part of Johannesburg in South Africa's 2008 census, recent demographic statistics are not readily available. It has been estimated that 40% of Johannesburg's residents live in Soweto. However, the 2008 Census put its population at 1.3 million  (2010) or about one-third of the city's total population. Soweto's population is predominantly black. All eleven of the country's official languages are spoken, and the main linguistic groups (in descending order of size) are Zulu, Sotho, Tswana, and Tsonga. SAAF 1723, a decommissioned Avro Shackleton of the South African Air Force is on static display on the roof of Vic's Viking Garage, a service station on the Golden Highway. The suburb was not historically allowed to create employment centres within the area, so almost all of its residents are commuters to other parts of the city. Metrorail operates commuter trains between Soweto and central Johannesburg. Soweto train stations are at Naledi, Merafe, Inhlazane, Ikwezi, Dube, Phefeni, Phomolong, Mzimhlophe, Mlamlankunzi, Orlando, Nancefield, Kliptown, Tshiawelo and Midway. The N1 Western Bypass skirts the eastern boundary of Soweto. There is efficient road access for many parts of the region along busy highways to the CBD and Roodepoort, but commuters are largely reliant on trains and taxis. The N12 forms the southern border of Soweto. A new section of the N17 road (South Africa) is under construction that will provide Soweto with a 4 lane highway link to Nasrec. The M70, also known as the Soweto Highway, links Soweto with central Johannesburg via Nasrec and Booysens. This road is multi lane, has dedicated taxiways and passes next to Soccer City in Nasrec. A major thoroughfare through Soweto is the Golden Highway. It provides access to both the N1 as well as the M1 highways. Minibus taxis are a popular form of transport. In 2000 it was estimated that around 2000 minibus taxis operated from the Baragwanath taxi rank alone. A Bus rapid transit system, Rea Vaya, provides transport for around 16 000 commuters daily. PUTCO has for many years provided bus commuter services to Soweto residents. The area is mostly composed of old "matchbox" houses, or four-room houses built by the government, that were built to provide cheap accommodation for black workers during apartheid. However, there are a few smaller areas where prosperous Sowetans have built houses that are similar in stature to those in more affluent suburbs. Many people who still live in matchbox houses have improved and expanded their homes, and the City Council has enabled the planting of more trees and the improving of parks and green spaces in the area. Hostels are another prominent physical feature of Soweto. Originally built to house male migrant workers, many have been improved as dwellings for couples and families. In 1996, the City of Johannesburg Metropolitan Municipality awarded tenders to Conrad Penny and his company Penny Brothers Brokers & Valuers (Pty) Ltd. for the valuation of the whole of Soweto (which at the time consisted of over 325 000 properties) for rating and taxing purpose. This was the single largest valuation ever undertaken in Africa. The role and played and contribution made by Soweto in the television broadcasting, it leads Soweto to establish/form its own on television. Soweto TV is a South African community television channel broadcasting in the biggest township in South Africa, Soweto. The channel is free-to-air in Gauteng Province and it also broadcast to South African subscribers on the DStv pay TV service on channel 251. The channel studios are situated on one of the most popular streets in Soweto, Vilakazi Street; well known for being the only street in the world to have the historical residences of two Nobel Prize winners, namely Nelson Mandela and Archbishop Desmond Tutu. Soweto TV programming is mostly Sowetan content as per ICASA's regulations of over 60% local content. Soweto Online is a geographical-based information-sharing portal. Soweto Internet Radio is a digital media network company established in 2008. Soweto TV is a community television channel, available on DStv channel 251. The Sowetan newspaper has a readership of around 1.6 million. Kasibiz Mahala is a free community magazine that promotes local small businesses established in 2012. Soweto is credited as one of the founding places for Kwaito and Kasi Rap, which is a style of hip hop specific to South Africa. This form of music, which combined many elements of house music, American hip-hop, and traditional African music, became a strong force amongst black South Africans. The experiences of other developing nations were examined at the Soweto entrepreneurship conference, which looked for ways to help turn the economic tide in townships. SOWETO’S entrepreneurs gathered at the University of Johannesburg Soweto Campus on 13 and 14 April to engage with experts from all over the globe about how to enhance skills and value-add in township economies. The restrictions on economic activities were lifted in 1977, spurring the growth of the taxi industry as an alternative to Soweto's inadequate bus and train transport systems. In 1994 Sowetans earned on average almost six and a half times less than their counterparts in wealthier areas of Johannesburg (1994 estimates). 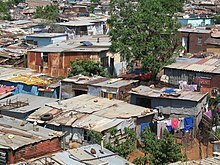 Sowetans contribute less than 2% to Johannesburg's rates Some Sowetans remain impoverished, and others live in shanty towns with little or no services. About 85% of Kliptown comprises informal housing. The Soweto Electricity Crisis Committee argues that Soweto's poor are unable to pay for electricity. The committee believes that the South African government's privatization drives will worsen the situation. Research showed that 62% of residents in Orlando East and Pimville were unemployed or pensioners. There have been signs recently indicating economic improvement. The Johannesburg City Council began to provide more street lights and to pave roads. Private initiatives to tap Sowetans' combined spending power of R4.3 billion were also planned, including the construction of Protea Mall, Jabulani Mall, and the development of Maponya Mall, an upmarket hotel in Kliptown, and the Orlando Ekhaya entertainment center. Soweto has also become a Centre for nightlife and culture. Soweto is home to two soccer teams that play for the top South African football league: the Kaizer Chiefs and the Moroka Swallows. Another club, the Orlando Pirates, originated from Soweto but moved to Parktown. Both the Chiefs and the Pirates feud in the rivalry known as the Soweto derby. The Soweto Open tennis tournament, part of the Challenger Tour is annually hosted in Soweto. The annual Soweto marathon is run over a 42.2-kilometre (26.2 mi) course through Soweto. The Soweto Wine Festival was started in 2004. The three-night festival is hosted at the University of Johannesburg's Soweto Campus on Chris Hani Road in the first weekend of September. Organised by the Cape Wine Academy, the festival attracts over 6000 wine enthusiasts, over 100 of South Africa's finest wineries and well over 900 fine wines. The Soweto Awards, which will become an annual event, honours those who have their roots in Soweto. Former president Nelson Mandela received the Life Time Award from the first Soweto Awards in Johannesburg on 25-02-2001. The Legends Awards went to Gibson Kente, the "godfather" of township theatre, Felicia Mabuza-Suttle, a talk show host, Aggrey Klaaste, editor of the Sowetan newspaper and Winnie Madikizela-Mandela, MP and African National Congress Women's League president. By 2003 the Greater Soweto area consisted of 87 townships grouped together into Administrative Regions 6 and 10 of Johannesburg. Estimates of how many residential areas make up Soweto itself vary widely. Some counts say that Soweto comprises 29 townships, whilst others find 34. The differences may be due to confusion arising from the merger of adjoining townships (such as Lenasia and Eldorado Park) with those of Soweto into Regions 6 and 10. The total number also depends on whether the various "extensions" and "zones" are counted separately, or as part of one main suburb. The 2003 Regional Spatial Development Framework arrived at 87 names by counting various extensions (e.g. Chiawelo's 5) and zones (e.g. Pimville's 7) separately. The City of Johannesburg's website groups the zones and extensions together to arrive at 32, but omits Noordgesig and Mmesi Park. Dlamini 1956 Unknown, Nguni family name. Michael Mabaso also comes from here. This is a township with of a working class population who travel by train to work. Klipspruit 1904 "Rocky Stream" (Afrikaans), originally a farm. Kliptown "Rocky Town", constructed from Afrikaans for rock (klip), and the English word "town". The economic development of Soweto was severely curtailed by the apartheid state, which provided very limited infrastructure and prevented residents from creating their own businesses. Roads remained unpaved, and many residents had to share one tap between four houses, for example. Soweto was meant to exist only as a dormitory town for black Africans who worked in white houses, factories, and industries. The 1957 Natives (Urban Areas) Consolidation Act and its predecessors restricted residents between 1923 and 1976 to seven self-employment categories in Soweto itself. Sowetans could operate general shops, butcheries, eating houses, sell milk or vegetables, or hawk goods. The overall number of such enterprises at any time were strictly controlled. As a result, informal trading developed outside the legally-recognized activities. By 1976 Soweto had only two cinemas and two hotels, and only 83% of houses had electricity. Up to 93% of residents had no running water. Using fire for cooking and heating resulted in respiratory problems that contributed to high infant mortality rates (54 per 1,000 compared to 18 for whites, 1976 figures. The restrictions on economic activities were lifted in 1977, spurring the growth of the taxi industry as an alternative to Soweto's inadequate bus and train transport systems. In 1994 Sowetans earned on average almost six and a half times less than their counterparts in wealthier areas of Johannesburg (1994 estimates). Sowetans contribute less than 2% to Johannesburg's rates. Some Sowetans remain impoverished, and others live in shanty towns with little or no services. About 85% of Kliptown comprises informal housing. The Soweto Electricity Crisis Committee argues that Soweto's poor are unable to pay for electricity. The committee believes that the South African government's privatization drives will worsen the situation. Research showed that 62% of residents in Orlando East and Pimville were unemployed or pensioners. There have been signs recently indicating economic improvement. The Johannesburg City Council began to provide more street lights and to pave roads. Private initiatives to tap Sowetans' combined spending power of R4.3 billion were also planned, including the construction of Protea Mall, Jabulani Mall, the development of Maponya Mall, an upmarket hotel in Kliptown, and the Orlando Ekhaya entertainment centre. Soweto has also become a centre for nightlife and culture. The 1976 uprising is depicted in the film A Dry White Season (1989), starring Donald Sutherland, Marlon Brando, and Susan Sarandon, who portray white South Africans pursuing justice for the deaths of black Soweto residents which followed the demonstrations. The American film Stander (2003) portrays the story of Andre Stander, a rogue police captain who sympathised with the state of apartheid and its corruption by becoming a bank thief. The Soweto uprising riots provided Stander's breaking point in the film. Sara Blecher and Rimi Raphoto's popular documentary, Surfing Soweto (2006), addresses the phenomenon of young kids "surfing" on the roofs of Soweto trains and the social problem this represents. The film District 9 (2009) was shot in Tshiawelo, Soweto. The plot involves a species of aliens who arrive on Earth in a starving and helpless condition, seeking aid. The originally benign attempts to aid them turn increasingly oppressive due to the overwhelming numbers of aliens and the cost of maintaining them, and to increasing xenophobia on the part of humans who treat the intelligent and sophisticated aliens like animals while taking advantage of them for personal and corporate gain. 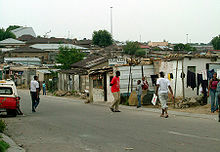 The aliens are housed in shacks in a slum-like concentration camp called "District 9", which is in fact modern-day Soweto; an attempt to relocate the aliens to another camp leads to violence and a wholesale slaughter by South African mercenary security forces (a reference to historical events in "District Six", Cape Town, a mostly Coloured neighborhood subjected to forced segregation during the apartheid years). The parallels to apartheid South Africa are obvious but not explicitly remarked on in the film. The marches by students in Soweto are briefly mentioned in Linzi Glass' novel, Ruby Red, which was nominated for the Carnegie Medal in 2008. Soweto is also mentioned in Sheila Gordon's novel, Waiting for the Rain. The main protagonist from the Jonas Jonasson Novel The Girl Who Saved the King of Sweden, Nombeko Mayeki was born in 1961 in Soweto. In his first Anthology of Poems titled "In Quiet Realm" South African Soweto Born poet Lawrence Mduduzi Ndlovu dedicated a poem called "Soweto My Everything" to honour the place of his birth. Clarence Carter has a song called "The Girl From Soweto" or "Where did the girl go, from Soweto". Soweto is mentioned in the song "Burden of Shame" by the British band UB40, on their album Signing off (1980). Singer–songwriter Joe Strummer, formerly of The Clash, referenced Soweto in his solo album Streetcore (song: "Arms Aloft"), as well as in The Clash's track, "Where You Gonna Go (Soweto)", found on the album London Calling (Legacy Edition). The UK music duo Mattafix have a song called "Memories Of Soweto" on their album Rhythm & Hymns (2007). Soweto is mentioned in the anti-apartheid song "Gimme Hope Jo'anna" by Eddy Grant. The line, "While every mother in a black Soweto fears the killing of another son", refers to police brutality during apartheid. Miriam Makeba has the song: "Soweto Blues". Dr. Alban's song "Free Up Soweto" was included in the album Look Who's Talking (1994). The Mexican group Tijuana No! recorded the song "Soweto" for their first album No, in reference to the city and the movements. "Soweto" is the name of a song by the rap group Hieroglyphics. The American band Vampire Weekend refers to its own musical style, a blend of indie rock and pop with African influences, as "Upper West Side Soweto", based on the same description of Paul Simon's album Graceland. "Soweto" is the title of the opening track of the album Joined at the Hip, by Bob James and Kirk Whalum. Brazilian singer-songwriter Djavan, in his 1987 album Não É Azul, mas É Mar, recorded a song called Soweto. Also this song inspired the naming of Brazilian pagode group Soweto. Morgan Gould (born 1983), Association footballer playing for Supersport United F.C. Siphiwe Tshabalala (born 1984), footballer playing for Kaizer Chiefs Football Club. Steven Pienaar (born 1982), footballer with national team and Everton F.C. The Soweto Gospel Choir. 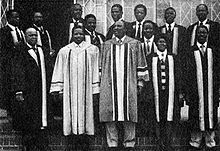 Songs and interview from NPR's All Things Considered Soweto Gospel Choir: 'Voices from Heaven', 4 February 2005. Soweto Melodic Voices, the youth choir selected to sing at the 2009 Confederations Cup. It has built its name in UK on Fringe festival in Edinburgh Scotland. ^ a b c d "Main Place Soweto". Census 2011. ^ "Soweto". Dictionary.com Unabridged. Random House. ^ MJ Viljoen & WU Reimold, An Introduction to South Africa's Geological and Mining Heritage, Mintek, Randburg, 1999, p. 33. ^ Viljoen & Reimold, supra, p.34. ^ Cammack,D., The Rand at War, University of Natal Press, 1990, p. 1. ^ Stals, supra, p. 52. ^ Cammack, supra, p. 9. Terms used then are now regarded as offensive. ^ Tshwane, Anthony. "Soweto". South African History Online. South African History Online. Retrieved 31 October 2018. ^ John R Shorten, The Saga of Johannesburg, John R Shorten (Pty) Limited, Johannesburg, 1970, p. 240. ^ Tshewu v Registrar of Deeds, 1905 T.S. 130. ^ Natives Land Act, No. 27 of 1913, section 8(1)(g) & (i). ^ French, Kevin John, James Mpanza and the Sofasonke Party in the development of local politics in Soweto, unpublished M.A. dissertation, University of the Witwatersrand, Johannesburg, 1983, p. 28. ^ Stark, Felix, Seventy Golden Years, 1886-1956, Municipal Public Relations Bureau, 1956, p. 525. ^ French, supra, p. 37. ^ French, supra, p. 45. ^ French, supra, p. 78. ^ Bonner, Philip & Segal, Lauren, Soweto - A History, Maskew Miller Longman, 1998, p.27. ^ Bonner & Segal, supra, p. 27. ^ "The Chris Hani Baragwanath Hospital, South Africa - The World's 3rd Biggest Hospital, in South Africa - Contact Details (Address, Phone Numbers, Email Address) and Map". Chrishanibaragwanathhospital.co.za. Retrieved 14 January 2019. ^ Bonner & Segal, supra, p.28. ^ a b Stark, supra, p. 527. ^ Tshwane, Anthony. "An African Village" (PDF). Wiredspace.wits.ac.za. Retrieved 1 November 2018. ^ Bonner & Segal, supra, p. 29. ^ Bonner & Segal, supra, p. 41. ^ Bonner & Segal, supra, p.30. ^ Bonner & Segal, supra, p. 31. ^ Mngomezulu & Others v City Council of Soweto, (1988) ZASCA 163. ^ Bonner & Segal, supra, p. 56. ^ a b c d e Carole Rakodi, ed. (1997). "5 Johannesburg: A city and metropolitan area in transformation". The urban challenge in Africa: Growth and management of its large cities. II The "mega-cities" of Africa. United Nations University Press. ISBN 92-808-0952-0. Retrieved 2009-11-16. ^ "Population of Soweto, South Africa". Mongabay.com. 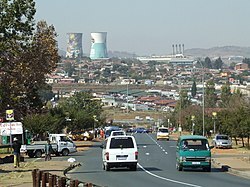 ^ a b "Census 2011: Main Place: Soweto". Census2011.adrianfrith.com. Retrieved 14 January 2019. ^ a b "Climate: Soweto - Climate graph, Temperature graph, Climate table". Climate-data.org. Retrieved 25 September 2013. ^ "West Wits". Metrorail (South Africa). Retrieved 2009-11-16. ^ "R360m 'Nasweto' highway to be completed by year-end". Engineering News (Creamer Media). 26 June 2009. Retrieved 2009-11-16. ^ "Bara taxi rank set for major upgrade". City of Johannesburg. 19 February 2003. Retrieved 2009-11-16. ^ "16 000 commuters use Rea Vaya daily". SABC. 16 September 2009. Retrieved 2009-11-16. ^ da Silva, M & Pirie, G.H. Hostels for African migrants in greater Johannesburg. GeoJournal, 12 (1986), 173–182. ^ "Visit the Soweto Online Portal". Sowe2online.com. ^ "Sowetan introduces jobs online". Bizcommunity.com. 17 January 2006. Retrieved 2009-11-17. ^ Basu, Dipannita. "The Vinyl Ain't Final". Retrieved 2009-08-13. ^ Tswane, Anthony. "SOWETO ENTREPRENEURS TARGETED". Joburg.org.za. City of Joburg. Retrieved 1 November 2018. ^ Tshwane, Anthony. "Mandela gets Soweto Award". News24.com. Retrieved 1 November 2018. ^ "Regional Spatial Development Framework" (PDF). City of Johannesburg. June 2003. Archived from the original (PDF) on 4 January 2006. Retrieved 16 November 2009. ^ "Soweto". Saweb.co.za. Retrieved 2009-11-16. ^ "Background to the study area: Soweto" (PDF). University of Pretoria. 2004. Retrieved 2009-11-16. ^ Millard, J. A. (1999). "Dube, John Langalibalele (Mafukuzela)". UNISA. Archived from the original on 21 December 2009. Retrieved 16 November 2009. ^ "John Langalibalele Dube". African National Congress. Archived from the original on 19 April 2009. Retrieved 2009-11-16. ^ "Dr James Sebe Moroka". SAHistory. Retrieved 2009-11-16. ^ "The Soweto Electricity Crisis Committee" (PDF). University of KwaZulu-Natal. 2004. Retrieved 2009-11-16. ^ "The real District 9". Mail & Guardian. 5 September 2009. Retrieved 2011-03-10. ^ "London Calling (Legacy Edition)". Amazon.com. Retrieved 2009-11-16. ^ "Soweto - Djavan". Letras.mus.br. Retrieved 14 January 2019. ^ Davie, Lucille (1 November 2004). "Gerard Sekoto's 'illustrious album'". Southafrica.info. Retrieved 2009-11-16. Philip Bonner & Lauren Segal (1998). Soweto: A History. South Africa: Maskew Miller Longman. ISBN 0-636-03033-4. Dumesani Ntshangase; Gandhi Malungane; Steve Lebelo; Elsabe Brink; Sue Krige (2001). Soweto, 16 June 1976. South Africa: Kwela Books. ISBN 978-0-7957-0132-0. Glaser, Clive (2000). Bo Tsotsi – The Youth Gangs of Soweto. United Kingdom: James Currey. ISBN 978-0-85255-640-5. Grinker, David (2014). Inside Soweto: Memoir of an Official 1960s-1980s. Johannesburg: Eastern Enterprises. ISBN 978-1-29186-599-8. Holland, Heidi (1995). Born in Soweto – Inside the Heart of South Africa. Penguin. ISBN 978-0-14-024446-5. Hopkins, Pat (1999). The Rocky Rioter Teargas Show. Cape Town: Zebra. ISBN 1-86872-342-9. Stephen Laufer; Matada Tsedu (2007). Soweto – A South African Legend. Germany: Arnoldsche. ISBN 978-3-89790-013-4. Tessendorf (1989). Along the Road to Soweto: A Racial History of South Africa. Atheneum. ISBN 0-689-31401-9. French, Kevin John, James Mpanza and the Sofasonke Party in the development of local politic in Soweto, unpublished M.A. dissertation, University of the Witwatersrand, Johannesburg, 1983. 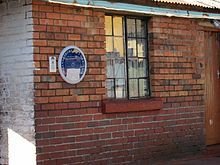 Wikimedia Commons has media related to Soweto.